We are now open for breakfast every day at 7AM. It is our pleasure to provide you with only the best possible food and service desired. 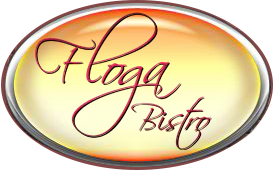 Floga Bistro promise to make your dining experience one that will keep you coming back again and again. It's our passion for food and the culinary arts that we love to share with our customers that come into our house. We sincerely appreciate your patronage and your comments. We can accommodate up to 45 people in house, for your private or business parties. We can also accommodate to your location!